You’re a VIP, don’t you know! We think all of our customers are great, so everyone receives the same First Class Voyager service and an equally exciting experience, whenever and wherever they fly with us. 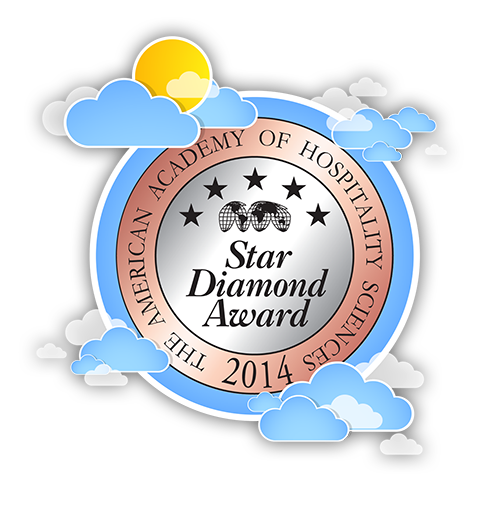 We make your transfer with luxury mini buses from your hotel to our indoor restaurant one hour prior to sunrise. Simply, you are free of winds, dust and cold. To offer a best possible flight and experience, we choose the most suitable take-off site for the day’s flight, depending on the direction and the strength of winds. Enchantment, romance, and excitement fill every colorful moment of this graceful adventure. The flight will last an hour but the memories will last a lifetime. All our balloons and equipment are manufactured in 2013, 2015 and 2016. 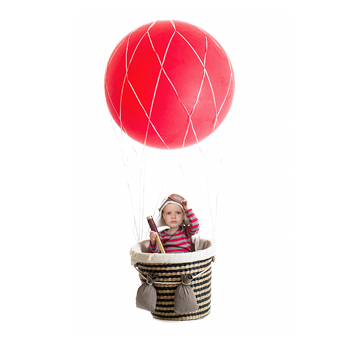 Our balloons and baskets are manufactured by the renowned Spanish Company UltraMagic. 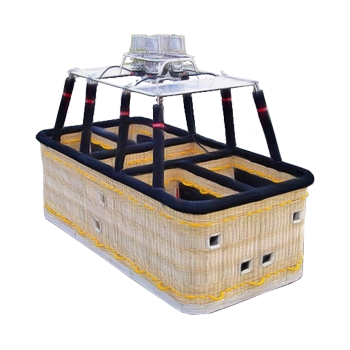 Our balloon baskets have better and improved designs to give you more security and comfort during flights. Our company policy is solely based on your safety and providing the best flight possible. Duration of a flight is determined by the flight type you take. To offer the best possible flight and the experience, we choose a take-off site for the day’s flight according to the direction and the strength of the wind. 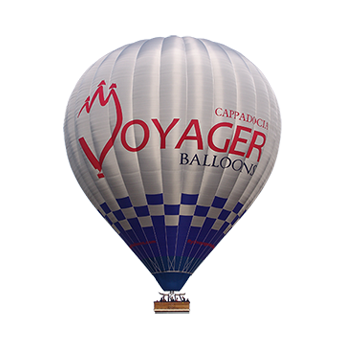 Voyager Balloons’ balloon pilots are FAA certified and have over 100 years experience combined ! 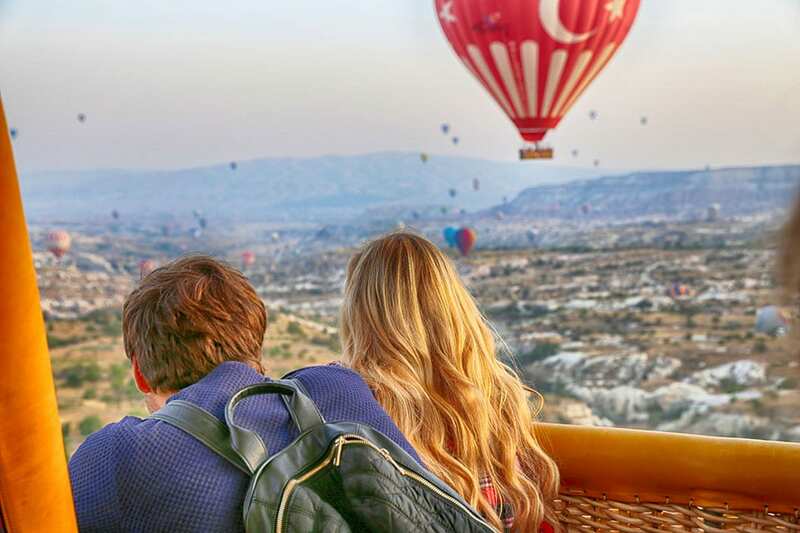 Our hot air balloon pilots have flown over 12,000 hours carrying more than 200,000 Voyager Balloons passengers . 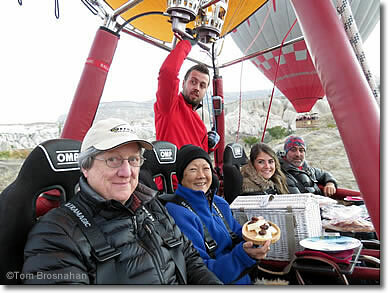 The team leader is M. Halis Aydogan who has been ballooning in Cappadocia since 1998. He is one of our distinguished pilots. Among the foreign languages, spoken by our team members are English, Japanese, Korean, Spanish. 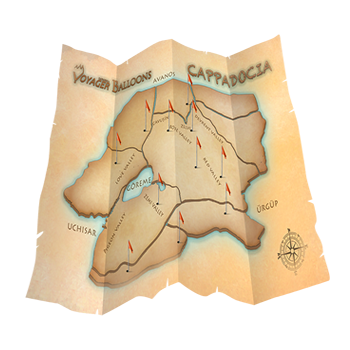 Our goal is to offer premium Hot Air Balloon Flights. 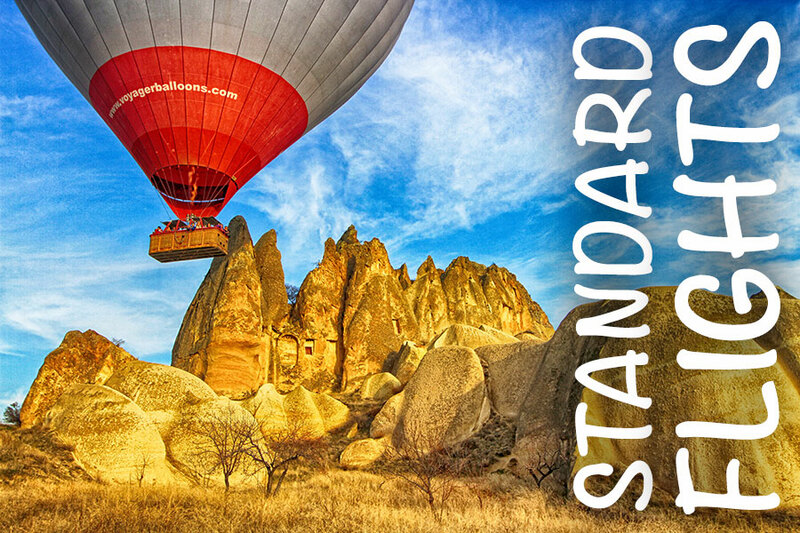 We fly throughout Cappadocia and our personal touch and professional experience will make your flight an unforgettable one. 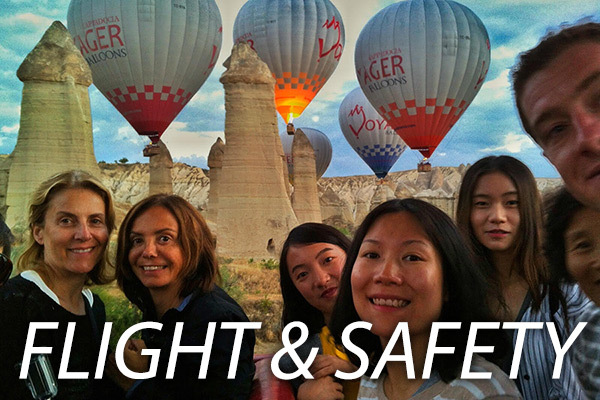 We are proud to maintain the best safety record in 18 years of flying over Cappadocia. Majority of our flights follow a more scenic flight plan and our flight time is longer than any other operators in the area. 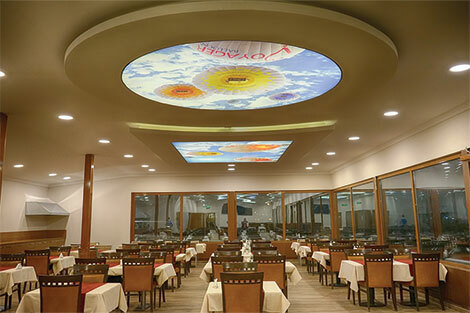 Before your flight, you have an open buffet – fully catered breakfast in our restaurant. We have a proper indoor place to enjoy early breakfast. 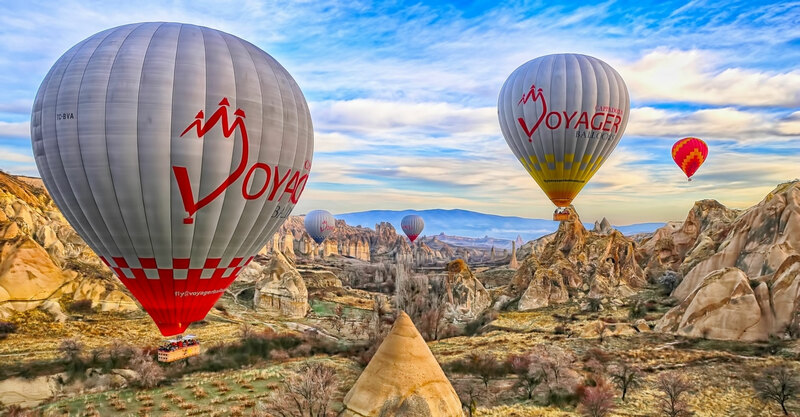 Voyager Balloons flies commercially insured and commercially rated FAA certified pilots with over 18 years of balloon flight experience, accompanied by a competent, experienced, fun loving ground crew and 12 new brand hot air balloons. 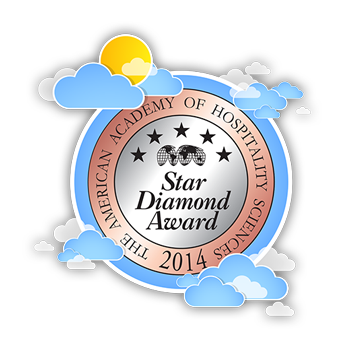 The American Academy of Hospitalty Sciences unanimously agree that this organization consistently maintains the overall standarts of high quality and superb performance necessary to designate it as one of the Finest in its Category and Classification. 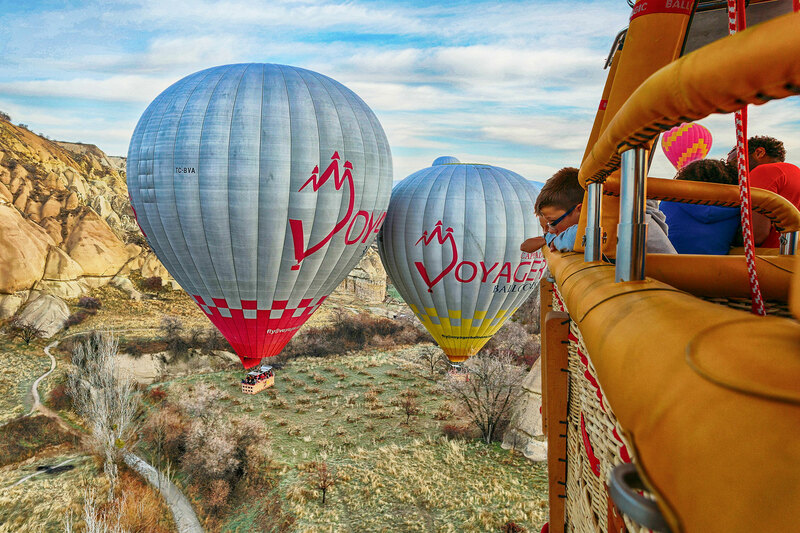 The award winning Voyager Balloons has been flying hot air balloons over the Cappadocia for over 18 years. 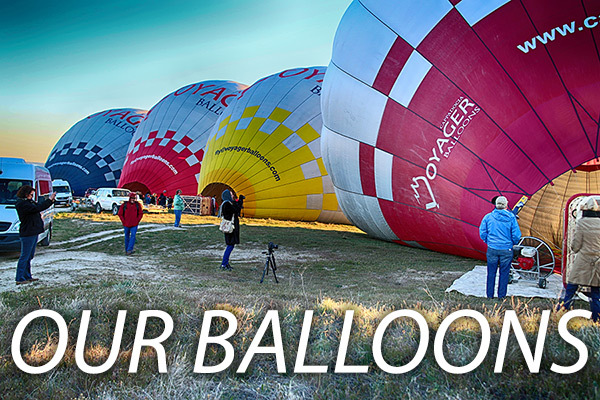 We have FAA certified pilots and aircraft, a professional staff and an outstanding safety record with 30 thousands of satisfied adventurers, experiencing the pleasure of hot air ballooning with Voyager Balloons, every year. 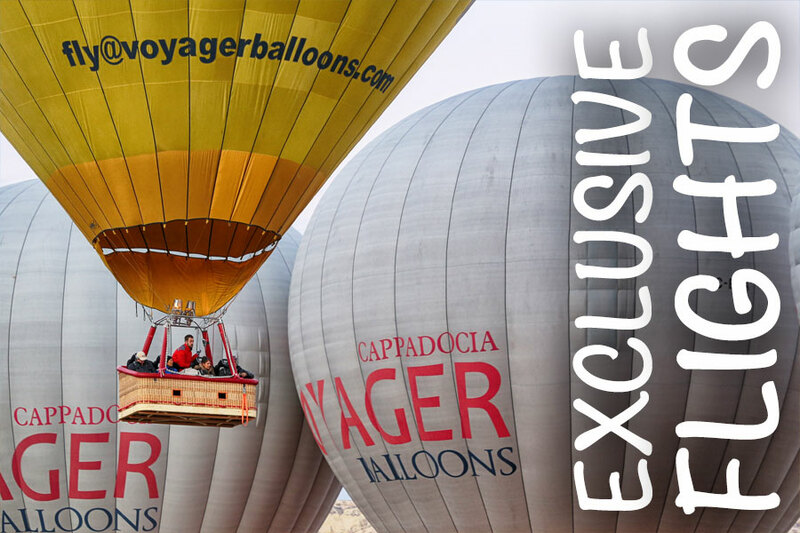 A high-quality ballooning company with experienced pilots and ground crew, Voyager offers a superior flying experience. 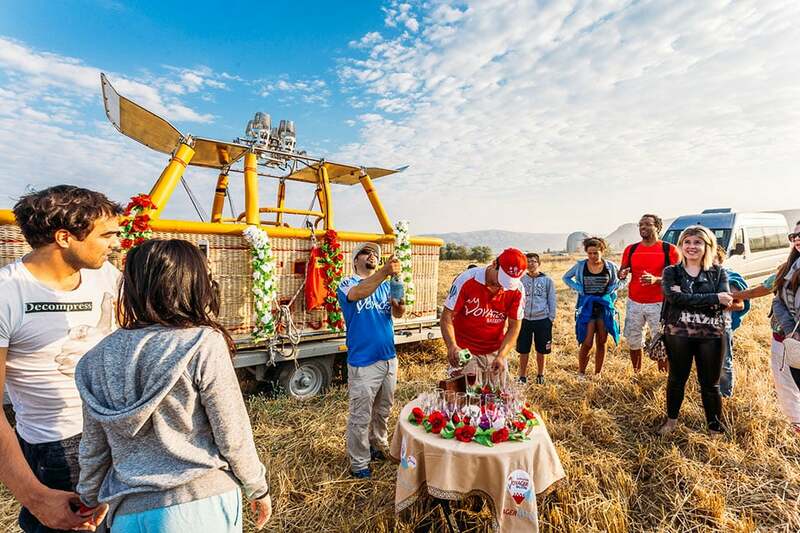 Four lucky passengers flying high with hors d’oeuvres in the sky in Voyager’s four-seat deluxe balloon. 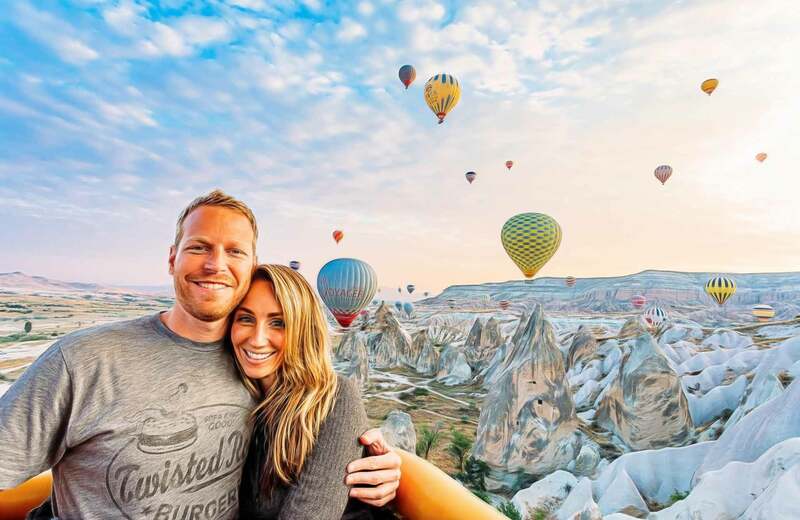 If you’ve never taken a flight in a hot-air-balloon, Cappadocia is one of the best places in the world to try it. 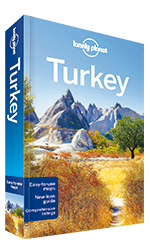 Recommended for its multilingual pilots and professional service. Highly recommended. 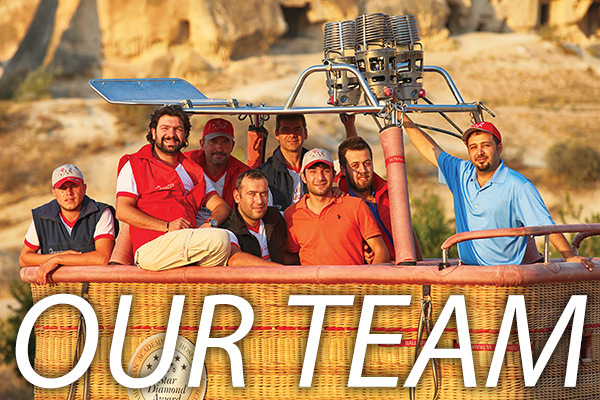 Run by experienced professionals, Cappadocia Voyager Balloons has certified pilots and newer balloons than some competitors. Three flight categories, based on capacity and duration, are available. 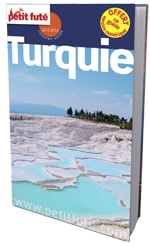 Halis Aydogan vous emmène dans les airs tous les matins de l’année, à moins que les conditions ne le permettent pas, chose rare en Cappadoce. We have a proper indoor place to enjoy early breakfast. Simply, you are free of winds, dust and cold. 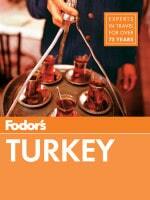 Cups of coffee or teas will go well with traditional pastry as well as cheese, olives, cake, fruits etc. After the breakfast we transfer you to our take-off area. Inflation takes about 20 minutes. 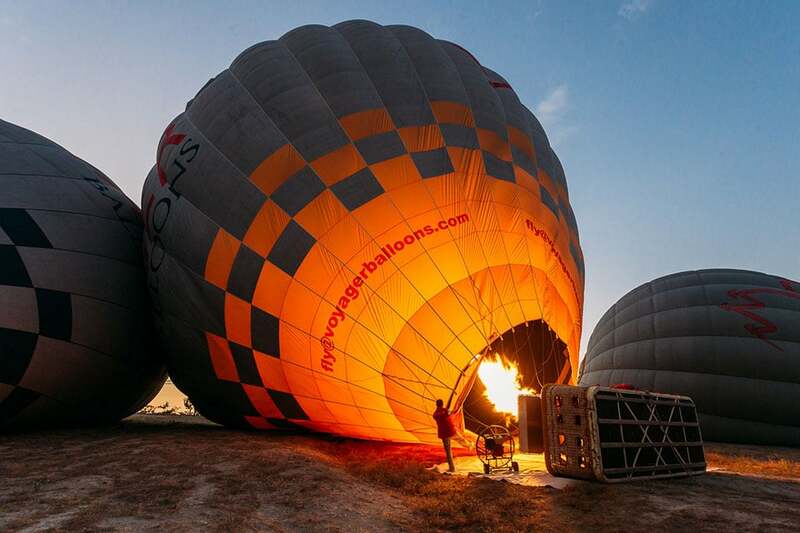 One of the life’s most fascinating sights is the set-up and inflation of a hot air balloon. 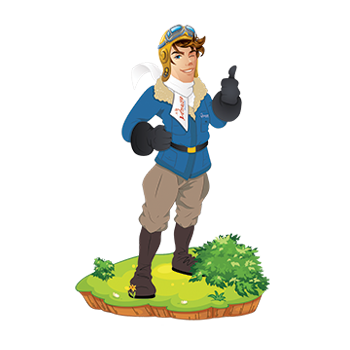 Once the balloon is ready, the passengers receive their call and the adventure begins with the pilot briefing. 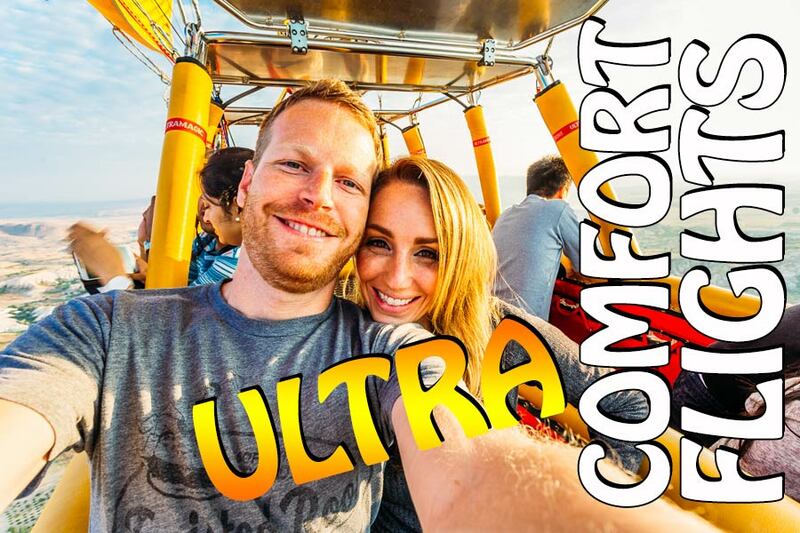 The sensation of ballooning is very gentle and its calming effect seems to put the world below into perspective. Rock formations and world-famous fairychimneys drift into view, giving you an unmatched feeling of being above it all. After your flight, when your feet find their way back to earth, the crew will meet you, and help you celebrate your voyage with the traditional champagne toast, commemorative flight certificate suitable for framing, and memories to last a lifetime.